To improve patient care and help clinical research, the Neuropathic Pain Special Interest Group of the Italian Neurological Society appointed a task force to elaborate a consensus statement on pharmacoresistant neuropathic pain. The task force included 19 experts in neuropathic pain. These experts participated in a Delphi survey consisting of three consecutive rounds of questions and a face-to-face meeting, designed to achieve a consensus definition of pharmacoresistant neuropathic pain. In the three rounds of questions, the participants identified and described the main distinguishing features of pharmacoresistance. In the face-to-face meeting the participants discussed the clinical features determining pharmacoresistance. They finally agreed that neuropathic pain is pharmacoresistant when “the patient does not reach the 50% reduction of pain or an improvement of at least 2 points in the Patient Global Impression of Change, having used all drug classes indicated as first, second, or third line in the most recent and widely agreed international guidelines, for at least 1 month after titration to the highest tolerable dose.” Our consensus statement might be useful for identifying eligible patients for invasive treatments, and selecting patients in pharmacological trials, thus improving patient care and helping clinical research. Giorgio Cruccu received received honoraria as speaker, member of advisory boards, or consultant from Alfasigma, Angelini, Biogen, and Lilly. Pierangelo Geppetti received honoraria for consultancy or speaking at symposia and research financial support from Amgen Allergan, Chiesi, Elettrocore, IBSA, Menarini, Novartis, Pfizer, Sanofi, and TEVA. Marina de Tommaso received honoraria for speaking at symposia or research financial supports from Allergan, Novartis, and Mundipharma. Diego Fornasari has received honoraria as speaker, member of advisory boards, or consultant from Angelini, Alfasigma, Abiogen, Grunenthal, Pfeizer, and SPA. Paolo Marchettini received honoraria for speaking at symposia and training the field force from Angelini, Chiesi, Epitech, Eli Lilly, and Pfizer. Enrico Polati received honoraria for speaking at symposia from Grunenthal. Claudio Solaro served as advisory board the following companies: Biogen Idec, Merck Serono, Almirall, and GW Pharma. He received speaking honoraria from Biogen Idec, Merck Serono. He received research grants and support by the FISM (Fondazione Italiana Sclerosi Multipla). Stefano Tamburin received honoraria for speaking at symposia or research financial support from Epitech, FB Health, Mundipharma, and Pfizer. Andrea Truini received honoraria for speaking at symposia or research financial supports from Alpha-Sigma, Angelini, Epitech, FB Health, and Pfizer. The other authors reported no conflict of interest to declare. 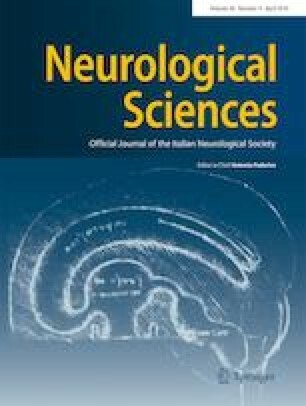 The face-to-face meeting was held during the congress of the Italian Society of Clinical Neurophysiology, receiving an unconditioned support by Pfizer.